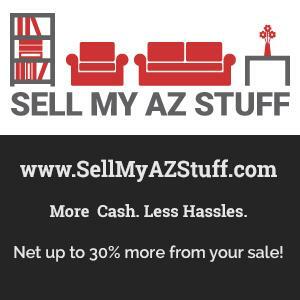 Sell My AZ Stuff is an estate sale company serving the Mesa, AZ area. 🕒❤ ONE DAY ONLY 🕒❤ ROCK BOTTOM PRICES **ALL ITEMS ARE ALREADY DISCOUNTED BY 67% to 80%*** SUNDAY January 8, 2016, 8:00 AM 1 DAY ONLY ESTATE SALE!!! COME GET A SMOKING DEAL ON SOME GREAT STUFF. 👍🎄AWESOME MARICOPA ESTATE SALE 🎄👌 EXCELLENT STUFF! AWESOME STUFF! CHEAP PRICES. EVERYTHING MUST GO!!! 👍🎄75% OFF MARICOPA ESTATE SALE 🎄👌 EXCELLENT STUFF! Moving Sale in Chandler with tons of great stuff at rock bottom prices. We're selling everything from a Ford F-150 truck to patio furniture and an accordion. Come find some unique treasures!